A trader has posted on Twitter alleging that an actor is taking advantage of Bithumb’s 120% fee payback to milk the platform of approximately $150,000 USD each day through washtrading. The Twitter account of Alex Kruger, a cryptocurrency trader, has posted allegations Bithumb is losing roughly $150,000 each day to a single opportunist actor who is exploiting the exchange’s 120% fee payback schedule. Elaborating upon his theory, Mr. Kruger posted “Bithumb offers 120% payback of trading fees as an airdrop,” before quoting Bithumb’s website – “Daily Limit 1 billion KRW, First Come First Served.” As of this writing, 1 billion KRW equates to approximately $890,068. News.Bitcoin.com reached out to Bithumb for commentary, however, did not receive a response. 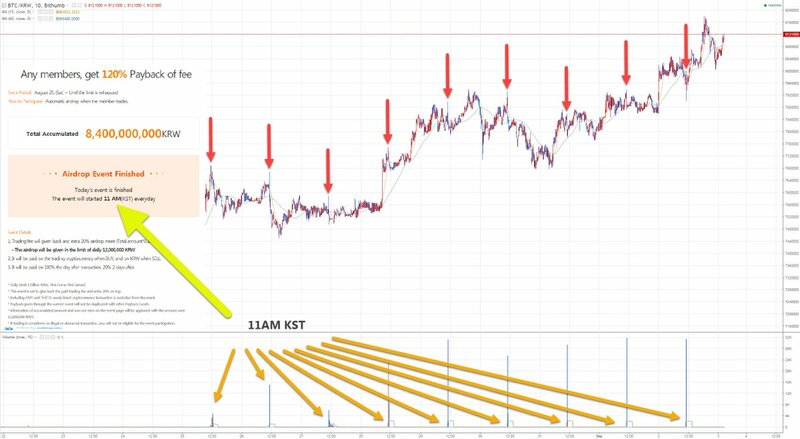 What is your response to the theory that a trader or traders are exploiting Bithumb’s 120% fee payback through washtrading? Share your thoughts in the comments section below! The post Trader Alleges Bithumb is Losing $150,000 USD Daily to Washtrading appeared first on Bitcoin News.